Size : PET Bottle 115 ml / 3.89 oz. 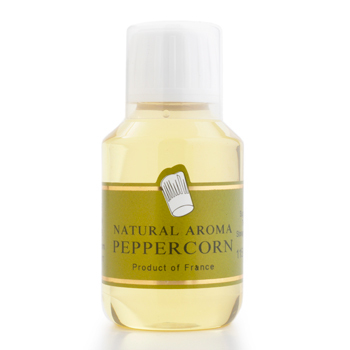 Black Peppercorn - Pure Concentrated Natural Flavor Culinary flavorings, much like perfumes use processes that have been around for centuries. Distillation, extraction and infusion are among the processes used to extract these natural flavors. Much in demand in the food industry our flavorings are now available in smaller container to use into your recipes and improve your repertoire as a chef. - A sauce can be transformed with only a few drops. - Since they have the same essence and quality as fresh produce. - Each bottle comes with a dropper to give you the perfect amount needed. - Since our flavors are available all year round you as a chef can keep the same items on the menu. - Our flavorings will allow for a better dish when product is a little bland. - An insipid dish can be rescued just before serving. - Bottles are made of unbreakable polyurethane PET yet transparent like glass. - We can provide you with over a hundred different flavorings for every imaginable use and taste. A large number of chefs use our flavorings and find them to be indispensable for boundless choice and creativity. They save time and guarantee superb results for standard fare as well as as for more elaborate dishes. These pure natural concentrated flavorings are now available in smaller quantity to allow culinary creations that were not easily achievable before.